I’m a Mennonite pastor living in the awesome town of Lawrence, Kansas. I enjoy pastoring, preaching, reading, creating art, crafting worship, praying, napping, facilitating retreats, thinking random thoughts, and writing about everything. I seek a spacious faith that surrounds all that I do and all that I am–with plenty of room to explore and grow. This blog is a bit of a spiritual discipline for me. I pray it is a welcome companion for you along your spiritual journey. You are welcome to use material from this blog in your own worship settings. Attribution is appreciated: “By Rev. 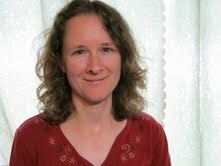 Joanna Harader, from SpaciousFaith.com.” And I always love to hear from people who find this material helpful. I am an ENFP and am starting to have a pretty firm suspicion that I am an Enneagram 7. So I’m not the most consistent blogger. I go through periods of excited, frequent posting, and periods of relative silence. It’s just my way. Don’t be alarmed. I post a lot of worship material and sermons–because I have to write that stuff anyway. You can use the “Categories” tab (on the right sidebar) to see pieces by type: call to worship, offertory prayer, etc. The “Index” page allows you to look up pieces related to specific texts, seasons, or topics. Please note that I post full sermon texts as pages, not posts; so the only way to access them is through the index or sometimes through links on posted excerpts. Besides worship material, I sometimes post about creative prayer practices, parenting problems, theological musings, art projects, Mennonite Church USA, and justice issues. Finally, you should know that this is my blog. I approve comments before they show up on the blog. And if you do not play nice, I will reject your comments and pray for your immortal soul. What I write represents my views and reflects my mood on a particular day. My views are not necessarily the views of Peace Mennonite Church, Western District Conference, or Mennonite Church USA. Really. Trust me on this. As a retired UM clergywoman, I have been invited to lead sunrise communion for a group of very traditional people. I was so delighted to find your liturgy and have used it almost without changing. (I did give you credit!) Thank you for providing help in such a concrete way. May this Holy Week give you opportunities to see God at work in your life amidst the challenges. Thank you again. I’m delighted to hear that you will use the communion liturgy on Sunday. Blessings to you this week as we journey through the cross. Joanna, You are just too much. Loving so much getting to know you on my visits to Lawrence to see my grandsons, Benny and Pete and of course my awesome daughter, Jenny and loving son-in-law, Tom. You are a funny, filled with joy, spiritual being. I’m so glad that my daughter and her family have you in their lives. Peace and love from my little village beneath the Peak. Haven’t done much writing about my faith at this point on my blog. Think that’s going to change because I’m feeling it’s a bit superficial. Glad I happened upon your blog! Hi Joanna! Great blog. Looking forward to getting to know you through your writing. Hello, Joanna. I love what you create here. Thank you. I am a former Catholic theology teacher now embracing my faith as a Mennonite in Seattle. I have just begun a mission church with a Lutheran pastor, in hopes of giving sacred, hospitable space to those who are alienated from institutional church. This post introduces us. Blessings on your excellent work here. Rita, thank you for being in touch. What an exciting ministry you are part of! Blessings to you and your community. Hi Joanna, I stumbled across your blog this year as I was fishing on the internet for new and interesting worship materials. I’m a pastor, you see, and besides coming up my own prayers and litanies, I like to see the inspiration of others. So I am looking and am borrowing from time to time. Thank you for posting your work for all to see. Very generous of you! You may have inspired me to do the same in the future . . . Thanks for the note, Doug. Always good to hear from other Mennonite pastors. If you do end up posting some of the material you write, be sure to link me up! I also go fishing for worship materials. Peace. I am a new minister trying to grasp writing liturgy, prayers and sermons in a faithful, cohesive and impactful way and have found such inspiration from your liturgy. Thank you for sharing your faith in writing. Kate, thank you so much for the kind note. I am so glad that my writing can be a small part of your support system as you begin your ministry. Deep peace and joy to you. I was looking for an appropriate Call to Worship to go with my liturgy for Pentecost and came across your info. Imagine my delight when I saw your picture and realized whose works I was viewing. Hi, Bonnie! Glad you found the call to worship helpful. I pray you had a wonderful Pentecost celebration.